In this gently told picture book, a little boy enjoys his first day of baseball practice. Nick already loves baseball when his mother signs him up for a local team. His bedroom is decorated in baseball décor, his dreams feature hot-air balloons that look like baseballs, and he practices his pitch by tossing snacks at his dog. When he actually attends his first practice, it lives up to all his dreams. He learns new exercises, makes new friends, and has a friendly, team-oriented coach. 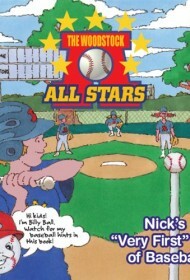 An extremely positive book, Nick’s Very First Day of Baseball doesn’t feature any central obstacle to overcome or puzzle to solve. Rather, it simply takes children through Nick’s first day on a baseball team, serving as gentle reassurance that such an experience is non-threatening and fun. Stylistically, the blocky, colorful illustrations feel a bit dated. And although Nick’s enthusiasm is enough to draw readers along the first time, a lack of stakes may make subsequent reads less interesting. Nonetheless, Nick’s Very First Day of Baseball is an effective way to excite kids about athletic play, providing an accessible, easy-to-follow introduction to the sport.